Location: - Situated in a delightful semi rural setting the property benefits from superb views over the surrounding countryside yet does not feel at all isolated. Peasfield is found along a small country track just 1.5 miles out of the pretty village of Westmill. Westmill is one of the areas premier villages with the community being centred around the village church, tea room and the Sword in Hand pub. The bustling market town of Buntingford is just three miles away and offers more extensive amenities and the larger towns of Ware (11 miles) and Stevenage (12 miles) offer the nearest rail connections into London. Throughout the area there are many lovely footpaths and bridleways, one of which runs from the property for miles without being near a road. For the keen golfer East Herts Golf Club is also close by. Cloakroom: - With low flush wc, wash hand basin with cupboards under, tiled surrounds. Family Room: - 27'4 x 14'10 (8.33m x 4.52m) - Dual aspect, exposed timbers, two double radiators, TV aerial point, power points. Study: - 10'9 x 8'7 (3.28m x 2.62m) - Double radiator, access to front. Lounge: - 28'6 x 19'1 (8.69m x 5.82m) - A most impressive room with full height vaulted ceiling of approximately 26'0, triple aspect, open fireplace, exposed red brick fireplace housing wood burner, two fully encased radiators, Minstrel gallery. Kitchen/Breakfast Room: - 21'8 x 12'2 (6.60m x 3.71m) - Oil supplied Aga, wall and base storage units finished with a natural timber panelled door, integrated fan assisted oven, granite work surfaces with tiled surrounds, enamel sink unit, plumbing for dishwasher, space for American style fridge/freezer, dual aspect, doors opening onto the rear terrace and garden. Inner Hallway: - Providing access to ground floor bedroom accommodation. Utility Room: - 11'9 x 11'0 (3.58m x 3.35m) - Wall and base storage units, plumbing for washing machine, tiled floor, single drainer stainless steel sink unit, stable door to outside. Bedroom One: - 17'9 x 9'7 (5.41m x 2.92m) - Fitted wardrobe cupboards incorporating chest of drawers and dresser unit, double radiator, vaulted ceiling. En Suite Bathroom: - Panel enclosed bath with shower attachment and screen, low flush wc, pedestal wash hand basin, ladder radiator/towel rail, tiled surrounds. First Floor Landing - 26'0 x 15'3 (7.92m x 4.65m) - Glazed screening to front and rear providing an attractive seating area with views east and west over the adjoining countryside and farmland, galleried on two sides. Study/Dressing Area: - 12'8 x 7'0 (3.86m x 2.13m) - Glazed screening to rear providing lovely country views to the west, doors opening to a further dressing area. 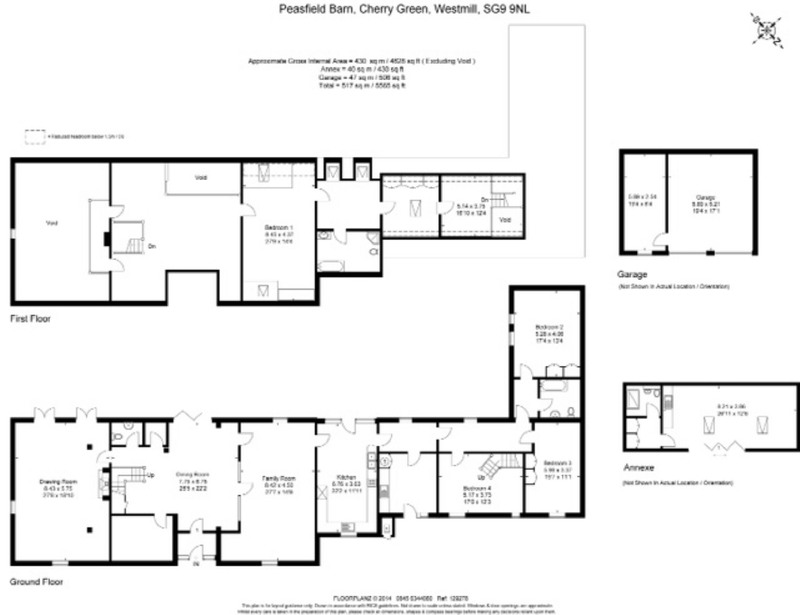 Bathroom: - 12'9 x 8'7 (3.89m x 2.62m) - Panel enclosed bath, vanity unit with wash hand basin and cupboard enclosures under, shower cubicle, low flush wc, ladder radiator/towel rail, loft access. Dressing Room Three: - 11'0 x 6'4 (3.35m x 1.93m) - Fitted with a range of wardrobe cupboards and chest of draws, conservation roof light, oak flooring. Cot Room/Bedroom Five: - 17'2 x 7'3 (5.23m x 2.21m) - Oak flooring, stairs leading to ground floor bedroom three. Double Heritage Style Garage Block: - With attached workshop and log store. GARAGE: 18'7 x 17'1 electronically operated roller doors, power and light connected. ATTACHED WORKSHOP: 18'7 x 8'0 fitted workbench and shelving with storage areas over. Gardens: - To the front the gardens are screened by mature hedges and laid mainly to lawn. There are various fruit trees and a natural pond. Timber garden store with two open sections approximately 9'9 x 8'0. The rear garden has been heavily landscaped and partially walled with a number of paved terraces that provide a lovely environment for al fesco eating and social entertaining. There are numerous flower beds some of which are raised and boxed. Walk-In Shower/Wet Room: - 7'0 x 5'9 (2.13m x 1.75m) - Shower, fully tiled surrounds, wall hung wash hand basin, wc, ladder radiator/towel rail. Living Area: - 26'10 x 12'8 (8.18m x 3.86m) - With under floor heating, bi fold doors opening onto the rear terrace and garden. Lounge Area: - Wired for wall hung TV, under floor heating. Kitchen Area: - One and a quarter bowl sink unit with base units and storage cupboards under, work surfaces over, Velux window.